The Toyota HD is a series of Diesel engines produced by Toyota. The 1HD-FT is a 4.2 L (4,164 cc) straight-6 24 valve SOHC turbocharged diesel engine of direct injection design. Bore and stroke is 94 mm × 100 mm (3.70 in × 3.94 in), with a compression ratio of 18.6:1. Known as the "multivalve" it has 4 valves per cylinder (2 inlet, 2 exhaust), central vertically mounted injector, and no glow plugs but rather an intake glow screen heater (like the later electronic 1HD-FTE below). The 4 valves per cylinder are actuated by the SOHC, by using bridges so each rocker actuates a pair of valves. Output is 168 hp (125 kW; 170 PS) ECE at 3,600 rpm with 380 N⋅m (280 lb⋅ft) of torque ECE at 2,500 rpm. ^ 1HZ, 1HD-T Engine repair manual (NCF064E ed.). Toyota Motor Company. Feb 1990. p. 14. 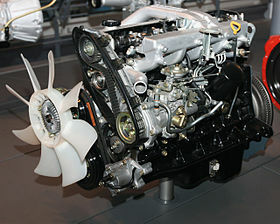 Wikimedia Commons has media related to Toyota HD engines. This article about an automotive part or component is a stub. You can help Wikipedia by expanding it. This page was last edited on 31 March 2019, at 08:31 (UTC).